It’s a Party of Indian Tapas! I have always link Indian cuisine with home cook and comfort food. Eating a cuisine that laden with a myriad of spices and slow simmering curries to be savor with roti or naan is simply soul food for me. When I crave for spicy curries or bread, I would want to enjoy a simple meal of carefully balanced spiced curry mopped up with flaky roti or crisp garlicky naan. That said, I would never had thought to party with Indian cuisine tapas style till I had savor this at Fiercer. Fiercer by Fierce Curry House is famous for their Hyderabadi Dum Biryani. Located in Solaris Dutamas, Publika, Fiercer is the offspring of the famous Fierce Curry House in Bangsar that has been serving up hearty portions of banana leaf rice to their many fans for a while. Fiercer doesn’t serve banana leaf rice but rather their signature of Hyerabadi Dum Biryani and a host of northern Indian dishes set in a modern and contemporary ambience. Owner Herukh Jethwani and his wife Aahana came up with the creation of Indian Tapas while they were honeymooning in Spain. Driven by their passion for food, both are taking Indian cuisine to a whole new level of creativity. 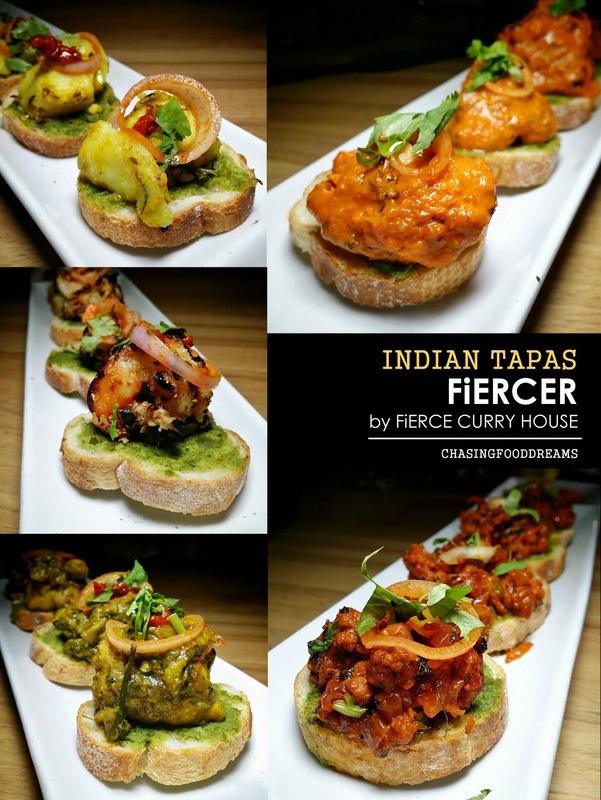 We were invited for a sneak preview of Fiercer’s Indian Tapas which is available now and is the perfect morsel of sumptuous Indian flavours packed on a canapé. We kicked off the tapas experience with Pani Puri (RM10), a popular street snack in India. Crispy pillows of hollow puri shells are filled with creamy potato cooked in spices and served with a spicy tangy mint chutney. Served in shot glasses, these were so adorable and packed quite a punch of flavours from spices and herbs. Samosa Chaat (RM12) looked like a pile of mess but once you had a taste of this snack, you would definitely enjoy what the mess is made up off. Crispy potato and onion samosa are drenched in minty tamarind chutney and yoghurt and topped with some fresh herbs and crispy bits. This is super yum with spicy and creamy flavours. There are more variations of Chaat in the menu so pick your choice of Papri Chaat or Aloo Tikka Chaat and more. They sure love their potatoes… not that I mind because I am also a huge potato fan. Jeera Aloo (RM17) is another potato dish cooked with lots of spices, chili, onions and herbs. If you are a fan of mutton, then you have to try their Gosht Keema Masala (RM32). Minced mutton cooked with heavy doses of spices till tender on canapés are damn good on crispy toast with mint chutney. Bold spices, smoky aroma, lightly tangy and creamy, there is something really addictive about this dish that many fans will agree with me. Seafood fans will definitely enjoy the Prawns Tikka Malai (RM32) and Fish Methi Masala (RM24). The Prawns Tikka Malai has a lovely smoky charred aroma as well as sweetness from fresh prawns while the Fish Methi Masala had a firm but tender fish in robust and herbaceous flavours. There are more seafood prepared in other various styles and served canapes too. Besides Indian Tapas, Fiercer’s Hyderabadi Dum Biryani is a delicious force to be reckon with! Based on the owner’s aunt’s recipe from Hyderabad, Herukh has tweaked the recipe to his own perfection over the years. With more than 20 ingredients for a pot of Dum Biryani, it’s no wonder Fiercer’s version is superbly flavourful with fluffly long grain Basmati rice seasoned and layered with meat or seafood and steamed for hours. Fiercer does not only offer the classic Dum Biryani with mutton, chicken or fish but has taken theirs to a whole new height of lavish ingredients with lobster, scallop, crab, cod, squid, venison, lamb shank and more with prior reservations. We had their Hyderabadi Dum Biryani Fish (RM20) which has a large piece of mackerel cooked with the biryani rice and spices. The biryani comes with some curry gravy, vegetable achar and raita. It was delicious…. fluffy rice grains well flavoured with lots of earthy aroma of spices. After digging into the layers of the rice, we unearthed a large piece of fish. The fish was tender and tasty too. When savored with all the side condiments, the biryani was even tastier as the gravy added more level of flavours, the achar gave a tangy and refreshing note and the raita cool down the heat of the spices. I have had their chicken version prior to this visit and it was also very good. Besides the biryani, we also had their Gosht Rogan Josh (RM28) and Chicken Orange Double Braised (RM30). The Gosht Rogan Josh packed quite a punch in flavours. Fiery, robust and complex, the thick mutton curry is cooked with lots of spices, onions, ginger, garlic and yoghurt. Famous for the punchy heat, savoring the Rogan Josh with rice or naan is simply divine. The boneless mutton is also very tender and has really soaked up all the goodness of the spices. The Chicken Orange Double Braised is probably the only dish that is not spice laden or spicy in heat in the whole menu. Made famous from the owner’s family restaurant Bangles from yesteryears, the dish is braised boneless chicken simmered in sautéed onions, capsicum and a fresh cream based sauce flavoured with orange juice. Its lightly sweet, creamy with hints of tangy orange notes. The dish is good for adults and kids. Other must-order treats from Fiercer are their vegetable dishes of Bhindi Masala (RM17), Eggplant Masala (RM17) and Tadka Dal (RM15). Both Bhindi Masala or Lady Fingers Masala and Eggplant Masala shared similar flavours but has their own unique note carefully balanced by the garam masala spices. The Tadka Dal is one of my personal favorite dish at Fiercer. Unlike a lot of dal curries, this version has so much complex flavours. The creamy and tender yellow lentils are slow cooked with lots of onions, tomatoes, spices and chilies. The result is marvelous as I kept on ladling spoonfuls of the gorgeous dal onto my rice and naan. There are many assorted Indian bread served here from naan, roti, to chapatti, poori and Roomali roti. We had their Mixed Naan Basket (RM14) of Plain, Coriander, Butter and Garlic Naans that was fluffy and tender and served piping hot. No doubt its quite hard to save room for desserts but somehow we did. Fiercer’s classic Gulab Jamun (RM6) turned out to be another favorite of mine that evening. The milk balls soaked in heavy syrup is delicious. It has intense milky flavours and is very sweet of course but that’s what most Indian desserts’ characteristics are. This is one of the better Gulab Jamun I have tasted in the city. Besides traditional desserts, Aahana has her own dessert business, Pretty Little Layers Desserts that offers diners a list of Western desserts such as Cakes, Mousse, Pannacotta, Cake Pops and other sweet treats. Check out their Facebook page here or call them at 019 985 1945 to order. Delivery is also available at certain Klang area for a small fee. We had their Chocolate Mousse (RM18) and Mango Panna cotta (RM18). The Chocolate Mousse had a solid bittersweet note from the dark chocolate used while the Mango Panna cotta was perfectly set with a lovely sweet fruity mango flavour. This sure looks a whole lot classier than the original! Loved the food there. The food looks too good, I'm going shortly! !